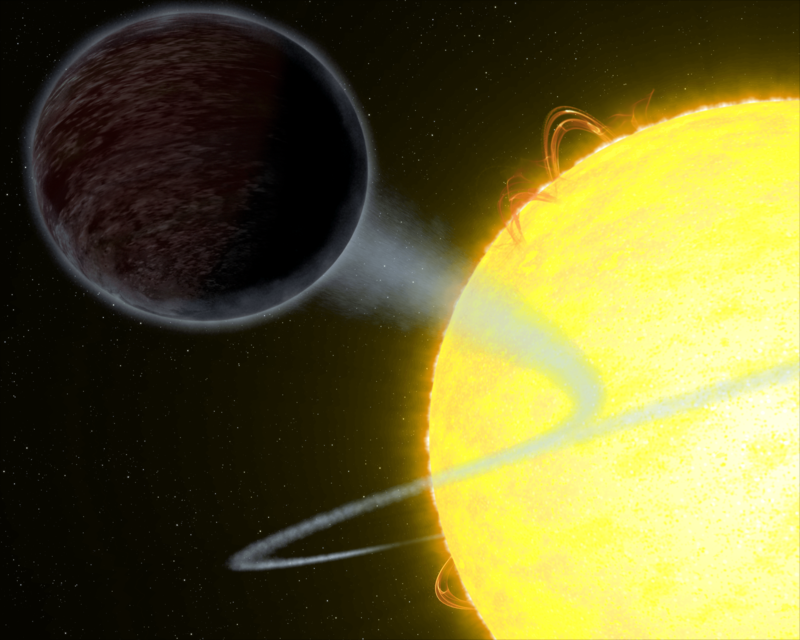 WASP-12b is one of the darkest known exoplanets — as black as fresh asphalt. The exoplanet, which is twice the size of Jupiter, has the unique capability to trap at least 94 percent of the visible starlight falling into its atmosphere. The planet orbits so close to its host that it has fixed day and night sides. The day side hordes all the visible light because it always faces its star. A swirl of material from the planet’s super-heated atmosphere is spilling onto its star. Credit: NASA, ESA, and G. Bacon (STScI). The article “The Very Low Albedo Of Wasp-12b From Spectral Eclipse Observations With Hubble” is published in the September 14 issue of The Astrophysical Journal Letters. In addition to Taylor Bell (McGill University, CRAQ/iREx), the team includes Nikolay Nikolov (University of Exeter), Nicolas Cowan (McGill University, CRAQ/iREx), Joanna K. Barstow (University College London), Travis S. Barman (University of Arizona), Ian J. M. Crossfield (University of Arizona), Neale P. Gibson (Queens University Belfast), Thomas M. Evans (University of Exeter), David K. Sing (University of Exeter), Heather A. Knutson (California Institute of Technology) ,Tiffany Kataria (JPL), Joshua D. Lothringer (University of Arizona), Björn Benneke (Université de Montréal, CRAQ/iREx) and Joel C. Schwartz (McGill University).